A technical primer and guide with advice about micropower broadcasting and other aspects of running a pirate radio station. Many people still assume that an FM broadcast station consists of rooms full of equipment costing tens of thousands of dollars. The Micropower Broadcasting, Free Radio Movement has shown this to be untrue. Micropower broadcasting uses FM transmitters whose power output is in the range of 1/2 to 40 watts. Such transmitters have a physical size that is not greater than that of your average brick. These transmitters combined with other equipment including inexpensive audio mixers, consumer audio gear, a power supply, filter and antenna enable any community to put its own voice on the air at an average cost of $1000-$1500. This is far more affordable than the tens or hundreds of thousands required by the current FCC regulatory structure. All of the technical aspects of putting together a micropower broadcasting station are covered in the following material. It is important to note that the main argument the FCC uses against micropower broadcasting is the issue of interference with other broadcast services. Interference is a valid concern. By using equipment that is frequency stable and properly fitted with harmonic suppression filters along with good operating procedures and standards, the FCC's argument can be effectively neutralized. Further, the technical aspects of micropower broadcasting require some basic knowledge in the areas of electronics and broadcast practices. Hopefully, this primer will be able to convey some of this knowledge to you. If you are unsure of your abilities try to find someone who has the technical experience to help you. It is hoped that as this movement grows a network of people with the required technical skills will be formed to assist in the process of empowering every community with its own voice. If you are a person with engineering or technical experience, please contact Free Radio Berkeley to become part of this network. Channel separation is the biggest problem. FM broadcast frequencies are assigned a frequency channel 200 kilohertz wide. Good broadcasting practice requires that at least one channel of separation must exist on either side of the frequency you intend to use. In other words, if you have picked out 90.5 as a possible frequency then 90.3 and 90.7 should be clear of any receivable signals. This is why a digital receiver is an important item for the frequency search. Once you have a complete listing of all the FM radio stations look for possible frequencies with the appropriate channel spacing. Depending on topography, distance and the output power of the other stations certain "used" frequencies may in fact be open. Compile a list of the possible frequencies. Then, using a digital FM receiver with an external antenna, scan and check these frequencies. Do this from a number of locations and at varied times within the area you propose to cover. In most cases weak, intermittent, or static filled signals can be ignored and counted as either usable or providing the necessary channel separation. Hopefully you will find at least one or two usable frequencies. If you live in a more rural area or some distance from a large urban area, finding a usable frequency should not be very difficult. 87.9 can be used as a frequency under two conditions. One, if there is not an existing station on 88.1, and two if there is not a TV Channel 6 being used in your area. After compiling your list of possible frequencies have your friends check them out on their receivers or radios as well. It is helpful to do since a variety of different receivers will more accurately reflect the listening conditions in your area. After all of this you should have a workable list of frequencies to use. Before you set up the station an adequate location must be found. Since the antenna will be there as well a site with adequate elevation is required. Ideally the top of a hill or a spot somewhere on the side of hill overlooking the area of coverage is best. FM transmission is "line of sight" the transmitting antenna and receiving antenna must be able to "see" each other. Therefore, any large obstructions will have a tendency to block the signal path. Keep this in mind when choosing your location. If your site is a 1 to 3 story building, a 30 foot push up style mast attached and guyed to the roof or a TV antenna style tower bracketed to the side of the building will be needed to provide adequate height for the antenna. At the very least you need to have the antenna at least 40-50 feet above the ground. In some areas a building permit may be needed to attach a mast or tower to a building. It is good practice to keep the transmitter some distance from the audio studio since the radio frequency emissions from the transmitter can get into the audio equipment and cause noise and hum. Your transmitter should be set up in another room, attic space, etc. as close to the antenna as possible. Keep the distance from the transmitter to antenna as short as possible to minimize signal loss in the coaxial cable feeding the antenna. These are some of the basic issues regarding site selection. Landlords, room mates, leases etc. are your problem. FM is an abbreviation for Frequency Modulation. Modulation is how information is imparted to a radio frequency signal. In the case of FM the audio signal modulates what is called the carrier frequency (which is the frequency of the broadcast signal) by causing it to shift up and down ever so slightly in response to the level of the audio signal. An FM radio receives this signal and extracts the audio information from the radio frequency carrier by a process called demodulation. Modulation of the signal takes place within the FM broadcast transmitter. The transmitter consists of several different sections: the oscillator, phase locked loop, and gain stages. Generation of the broadcast carrier frequency is the responsibility of the oscillator section. Tuning (as distinct from modulation) or changing the frequency of the oscillator section is either done electronically or manually. For a practical radio station that will be operated for more than a few minutes, it is almost essential to have the tuning done under electronic control since free running or manually tuned oscillators will drift in frequency due to temperature and inherent design limitations. This is an important consideration is selecting a transmitter. Since one of the goals is to deprive the FCC of technical objections to micropower broadcasting it is critical to have transmitters that stay on frequency and do not drift. This, of course, rules out using transmitters based on free running oscillators. Frequency control brings us to the next section. Oscillator frequency drift is corrected by a circuit known as a phase lock loop (PLL) controller. In essence, it compares the output frequency of the oscillator to a reference frequency. When the frequency starts to drift it applies a correction voltage to the oscillator which is voltage tuned, keeping it locked to the desired frequency. In a PLL circuit the frequency is selected by setting a series of small switches either on or off according to the frequency setting chart that comes with the transmitter. In some cases the switch array may be replaced by 4 dial-up switches that show a number for the FM frequency of transmission, i.e. 100.1 for 100.1 MHz. Even simpler, some units have a display like a digital radio with up and down buttons for changing frequency. One part of the oscillator section, the voltage tuning circuit, serves a dual purpose. As described above it allows the oscillator to be electronically tuned. In addition, it is the means by which the broadcast carrier frequency is modulated by an audio signal. When the audio signal is applied to this section the variations in the audio signal voltage will cause the frequency of the oscillator to shift up and down. Frequency shifts brought about by audio modulation are ignored by the PLL controller due to the inherent nature of the circuit design. It is important not to over modulate the transmitter by applying an audio signal whose level is too great. Many transmitters are equipped with an input level control which allows one to adjust the degree of modulation. Further control of the audio level is provided by a compressor/limiter which is discussed in the studio section. As the modulation level increases the amount of space occupied by the FM signal grows as well. It must be kept within a certain boundary or interference with adjacent FM broadcast channels will result. FCC regulations stipulate a maximum spread of plus or minus 75,000 cycles centered about the carrier frequency. Each FM channel is 200,000 cycles wide. Over modulation- the spreading of the broadcast signal beyond these boundaries- is known as splatter and must be avoided by controlling the modulation level. As a result the signal will be distorted and interference with adjacent channels will take place. Following the oscillator section are a series of gain stages which buffer and amplify the signal, bringing it to a sufficient strength for FM broadcast purposes. In most cases this will be 1/2 to 1 watt of output power. This level is sufficient for a broadcast radius of 1-2 miles depending on circumstances. For increased power a separate amplifier or series of amplifiers are used to raise the power level even higher. Amplifiers are covered in the next part of this primer. Progressive Concepts, Panaxis and Ramsey. Assembly requires a fair degree of technical skill and knowledge in most cases. Free Radio Berkeley offers an almost fully assembled 1/2 watt PLL transmitter kit requiring a minimal amount of assembly. Kits from Ramsey are rather debatable in terms of broadcast quality. An English firm Veronica makes some rather nice kits as well. Although 1/2 to 1 watt may be perfectly adequate for very localized neighborhood radio coverage, higher power will be required to cover larger areas such as a town or a portion of a large urban area. In order to increase the output power of a low power FM exciter or transmitter an amplifier or series of amplifiers are connected to the output of the transmitter. Amplifiers are also referred to as amps, and should not be confused with the unit of current also called amps. Amplifiers are much simpler in design and construction than a transmitter. Most of the amplifiers used in micropower broadcasting employ only one active device, an RF power transistor, per stage of amplification. By convention most broadcast amplifiers have an input and output impedance of 50 ohms. This is similar to audio speakers having an impedance between 4 and 8 ohms. When an RF amplifier with a 50 ohm input impedance is attached to the 50 ohm output impedance of a transmitter this matching of impedances assures a maximum flow of electrical energy or power between the two units. A mismatch between any elements in the chain from transmitter to amplifier to filter to antenna will reduce the efficiency of the entire system and may result in damage if the difference is rather large. Imagine the results if a high pressure water pipe 4 inches in diameter is forced to feed into a 1/2" water pipe with no decrease in the action of the pump feeding the 4 inch pipe. In an RF amplifier the RF power transistor will heat up and self-destruct under analogous conditions. An RF power amplifier consists of an RF power transistor and a handful of passive components, usually capacitors and inductors which are connected in a particular topology that transforms the 50 ohm input and output impedances of the amplifier to the much lower input and output impedances of the RF power transistor. Detailed circuit theory of this interaction between the components is not covered in this primer. Amplifiers can be categorized as either narrow band or broad band. Narrow band amplifiers are tuned to one specific frequency. Broad band amplifiers are able to work over a specified range of frequencies. without tuning. Most of the amplifiers that have been used in micropower broadcasting are of the first type. A tunable amplifier can be a bit of a problem for those without much experience. In a typical tuned stage amplifier there will be two tuning capacitors in the input stage and two more in the output stage. If not correctly adjusted the transistor can produce unwanted sideband spurs at other frequencies both within and outside of the FM band. To make set up easier for the average micropower broadcaster a broad band amplifier is preferable or one with a minimal amount of tuning stages. Several designs are available. One rather popular one is a 20-24 watt amplifier using a Phillips BGY33 broad band power amplifier module. It is a rather rugged device that requires no tuning and produces a full 20-24 watts output for 250 milliwatts of drive from the transmitter. Free Radio Berkeley has a kit based on this device. This kit includes an output filter as well which other vendors may not include in their kits. Regardless of the source, the BGY33 is not the most efficient device and requires a good sized heat sink for proper dissipation of heat, and the use of a cooling fan is strongly suggested as well. If you buy a kit or transmitter package based on this device be certain to determine from the manufacturer that the BGY33 is mounted directly to the heat sink, not to a chassis panel with a heat sink on the other side of the chassis panel. It must directly contact the heat sink with a layer of heat sink heat compound between the module mounting flange and the heat sink surface. Broad band designs are not as a common due to the degree of design experience required to create a functional unit. It seems a number of kit providers are content not to optimize and improve their amplifier designs. Free Radio Berkeley is now offering amplifiers that are either no tune or minimal tune designs in several different ranges of power. Certain broad band designs may be too wide in their range of frequency coverage and will amplify the harmonics equally well. For FM broadcast purposes the width of frequency coverage should be for only the FM band, about 20-25 Megahertz wide. Selecting the right amount of power is rather important since you should only use enough power to cover the desired area. Unfortunately there is not an easy answer to the question of how much area a certain amount of power cover. Antenna height is very critical, 5 watts at 50 feet will not go as far as 5 watts at 500 feet. Assuming you do not have a 10 story building or a convenient 500 foot hill to site your antenna and transmitter on, experience in urban environments has yielded the following rough guidelines. With based an antenna approximately 50 feet above the ground. 1/2 to 1 watt will yield an effective range of 1 to 3 miles, 5-6 watts will cover out to about 1-5 miles, 10-15 watts will cover up to 8 miles, 20-24 watts will cover up to 10-12 miles and 30-40 watts will cover up to 15 miles. Coverage will vary depending on terrain, obstructions, type of antenna, etc. If your antenna is very high above average terrain you will be able to go much further that the figures given above. Quality of the radios receiving your signal will be a determining factor as well. Since the power levels are rather low in comparison to other stations an external antenna on the receiver is highly suggested, especially an outdoor one. It is very important to provide adequate cooling for RF amplifiers. This means using a properly sized heat sink and an external cooling fan. Heat sinks have heat dissipating fins which must be placed in an upward pointing direction. Overheating will cause premature failure of the transistor. A cooling fan, usually a 4 to 5 inch square box fan, will offer extra insurance. It should be placed so that the air flows over the fins of the heat sink. Under no circumstances should an amplifier/transmitter be operated without a proper load attached to the output. Failure to do so can destroy the output transistor. When testing and tuning a dummy load is used to present a load of 50 ohms to the transmitter/amplifier. It is very bad practice to tune a unit with an antenna attached Use a dummy load of proper wattage rating to match the transmitter output wattage. An output filter must be used between the transmitter/amplifier and the antenna. Some amplifier kits come with a filter included, such as the 20 Watt FRB amplifier. These do not need an additional filter. More on this in the filter section. Heavy gauge (12-16 AWG) insulated stranded wire is used to connect the amplifier to the power supply. Observe correct polarity when making the connection. Reversing the polarity will result in catastrophic failure of the transmitter. Red is positive and black is negative or ground. Most of the transmitters and amplifiers used in micro broadcasting require an input voltage of 12 to 14 volts DC. Higher power amplifiers (above 40 watts) require 24-28 volts DC. In a fixed location the voltage is provided by a power supply which transforms the house voltage of 110 volts AC to the proper DC voltage. Power supplies are not only measured in terms of their voltage but current as well. A higher power amplifier is going to require a greater amount of input power as compared to a lower power amplifier. Output current is measured and specified as amps.. A power supply is selected on the basis of its continuos current output which should be higher than the actual requirements of the amplifier. Power supplies operated at their fully rated output will have a tendency to overheat under continuos operation. An amplifier which requires 8 amps will need a power supply with a 10 to 12 amp continuos capacity. In most cases the following ratings are suggested for transmitters requiring 13.8 volts. Any power supply you use must have a regulated voltage output along with protection circuitry. Some reasonably priced brands include Pyramid, Triplite and Astron. Do not use any of the wall transformer type of power supplies. Such units are not adequate for this application. Higher power transmitters require power supplies with an output voltage of 28 volts. Astron is the best manufacturer of this type of power supply. A 75 watt transmitter will require a power supply with a current rating of 6-8 amps and 28 volts. For mobile applications voltage can be fed from the cigarette lighter socket of a car with the correct plug and heavy gauge wiring. This may not work well in some newer vehicles with are reported to have some sort of current limit protection on the lighter socket. Check with an auto mechanic about this if you are in doubt. Electrical systems on newer vehicles are rather sensitive and can be damaged if not properly understood. Another problem with mobile operation is battery drain. A 20-40 watt transmitter running for 4-5 hours can deplete the battery to the point where the vehicle may not start. It is better to have separate battery running parallel to the charging system with an isolator. Isolators are available from Recreational Vehicle accessory suppliers. Use a high capacity deep discharge type of battery. Lead acid batteries are not very benign. Acid can leak and spill on people, clothing and equipment. It best to keep the battery in a plastic battery box. Vapors from the battery are explosive in confined areas. Keep this in mind for mobile vehicle operations. You might consider using a gell cell type of battery which is sealed and can not leak. These are a bit pricey but have far fewer problems. A good quality gel charger must be used to ensure battery longevity. Smaller gel cell batteries work really well for setting up a low power (6 watts or less) transmitter on a street corner as a public demonstration of micropower radio. In Berkeley a 6 watt micropower station is set up at the local flea market as a community demonstration on weekends. It is called Flea Radio Berkeley. Transmitters can be set up at demonstrations and rallies so motorists can tune their radios to the frequency which is displayed on large banners near the streets and listen in on what is happening. This has worked very well. Use your imagination to show how micropower broadcasting can be brought into the community. Although it is rather simple in design and construction a filter is one of the most important elements in broadcasting. No matter what, a proper filter must be used between the transmitter and antenna. Use of a filter will help deprive the FCC of one of its main arguments against micropower broadcasting - interference with other broadcast services. A proper filter reduces or eliminates harmonics from your broadcast signal. Harmonics are produced by the transmitter and are multiples of the fundamental frequency you are tuned for. For example, if you broadcast at 104.1, you may produce a harmonic at 208.2, and (less likely) 312.6 and so on. Most filter designs are of the low pass type. They let frequencies below a certain frequency pass through unaffected. As the frequency increases and goes beyond that point the filter begins to attenuate any frequency that is higher than the set point. The degree of attenuation increases with the frequency. By the time the frequency of the first harmonic is reached it will be severely attenuated. This is very important since the first harmonic from an FM transmitter falls in the high VHF TV band. Failure to reduce this harmonic will cause interference to neighboring TV sets. You do not want to generate complaints from folks who engage in the odious habit of watching TV. Noble sentiments, such as telling them to smash their TV if they have a problem will not suffice. Use a filter. Complaints increase the possibility of the FCC showing up at your door. One needs to be good broadcast neighbor and an asset to the community. Harmonics further up the scale can cause interference to other mobile and emergency radio services. Not desirable either. Transmitters with output power ratings of less than 25 watts will need at least a 7 pole design. Higher power units will need a 9 pole design. An increase in number of poles increase the degree of attenuation. Representative designs are shown. If you build one of these put it in a metal, well shielded enclosure. An antenna's primary purpose is to radiate the FM broadcast signal from the transmitter to surrounding FM radio receivers. In order to do this several conditions must be met. First, the antenna must be tuned to the frequency being transmitted. Secondly, it must be sited and oriented properly. At FM frequencies the radio waves travel in a straight line until an obstacle is met. This is known as line of sight transmission. If the receiving antenna and transmitting antenna can "see" each other and the path distance is not too great to attenuate the signal, then the broadcast signal can be received. Radio signal strength is based on the inverse square law. Double the distance and the signal strength will be 1/4 of what it was. Since FM broadcast transmissions are line of sight, the height of the antenna is very important. Increasing the height is more effective than doubling or tripling the power. Due to the curvature of the earth the higher the antenna the greater the distance to the horizon. Increased height will place the antenna above obstructions which otherwise would block the signal. Your antenna should be at least 40-50 feet above the ground. Count yourself lucky if you can site the antenna on a hill or a ten story building. An antenna is rough tuned by adjusting the length of the radiating element(s). Many antenna designs are based on or derived from what is called a dipole, two radiating elements whose length is roughly equivalent to 1/4 of the wavelength of the desired frequency of transmission. Wavelength in inches is determined by dividing 11811 by the frequency in megahertz. The result is either divided by 4 or multiplied by .25 to yield the 1/4 wavelength. A correction factor of .9 to .95, depending on the diameter of the element, is multiplied times the 1/4 wavelength resulting in the approximate length of each element. Fine tuning the antenna requires the use of an SWR power meter. SWR is an abbreviation for standing wave ratio which is the ratio between power going into the antenna and the power being reflected back by the antenna. A properly tuned antenna is going to reflect very little power back. Correct use of an SWR meter is described a bit further down in this section. IF you can afford $100. get a dual needle meter which shows both reflected and forward power at the same time. A good brand is Daiwa. A dipole with tuning stubs is one of the easiest antennas to make and tune. Two dipoles can be combined on a 10 foot mast if they are spaced 3/4 of a wavelength from center to center with the elements vertical and fed with a phasing harness. A phasing harness consists of two 1.25 wavelength pieces of 75 ohm coaxial cable (RG11) cut to a length that is the product of the 1.25 wavelength times the velocity factor (supplied by the manufacturer) of the cable A PL259 plug is attached to the end of each cable. These are connected to a 259 T adapter with the center socket being the connection for the feed cable coming from the transmitter. The other ends go respectively to each dipole. Such an arrangement will increase the power going into the antenna by a factor of 2. 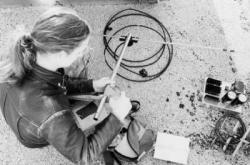 Besides the dipole a number of other antenna designs are employed in micropower broadcasting. Each one has a characteristic pattern of coverage. Antennas can be broken down into two basic types – omnidirectional and directional. Under most circumstances the omni is the antenna of choice for micropower broadcasting. Polarization is another aspect to consider but does not play that big of a role in most cases. Antennas can be vertically, horizontally or circular in polarization. Most micro broadcast antennas are vertically polarized. In theory a vertically oriented receiving antenna will receive better if the transmitting antenna is vertically oriented as well. Obstructions in the receiving environment will have a tendency to bounce the signal around so that the signal will be not be exactly vertically polarized when it hits the receiving antenna, particularly in a car that is moving. Commercial broadcasters employ circular polarization which yields both vertical and horizontal components to the signal. It is said that this is best for car radios. This may be true given the dependence of commercial broadcasters on "drive time" as a peak listening period. A single radiating element vertically oriented will have a rather high angle of radiation where a good portion of the signal is going up to the sky at angle of around 35 degrees or more. When you combine two vertical elements such as two dipoles you reduce the angle of radiation to a point where the signal is more concentrated in the horizontal plane. This is what accounts for the apparent doubling of radiated power when you use two dipoles phased together. Power output from the antenna or antenna array is known as effective radiated power (ERP) and is usually equal to or greater than the input power. Several vertical element antenna designs have a lower angle of radiation even though they only use one element. These are the J-Pole and the Slim Jim designs. Having a signal pattern that is more compressed into the horizontal plane makes the Slim Jim ideal for urban environments. Both can be easily constructed from ½" copper pipe and fittings. Plans are available from FRB directly or the FRB web site. Another class of antennas are the 1/4 and 5/8 wave ground plane antennas. A commercially manufactured 5/8 ground plane for FM broadcast purposes is available for around $100. It is an ideal antenna for those want an easy to tune and assemble antenna. Set up time is less than 15 minutes. Plans for these antennas are available from FRB. Directional antennas are not usually required for micropower broadcasting. If the area you wish to cover lies in one particular direction you might consider the use of such an antenna. An easy way to do this is to put a reflecting screen 1/4 of a wavelength behind a vertical dipole. The screen will need to be bit taller than the total length of the elements and about 2-3 feet wide. This will yield a nice directional pattern with a fair amount of power gain Your pattern will be about 60-70 degrees wide. Another type of directional antenna is the yagi which has a basic dipole as the radiating element but additional elements as reflectors and directors. A yagi can be a bit difficult to build for those not well versed in antenna design and construction. Your best choice is a dipole with a reflector. For those who wish for a practical design that can be built and put to use the following is a basic dipole antenna which can be constructed from common hardware store items. It uses 1/2 inch copper water pipe and fittings along with aluminum tubing. A half inch plastic threaded T is used with a copper 1/2 inch threaded to 1/2 inch slip adapters at all three points. An aluminum tube 9/16 of inch or so in diameter will fit into this slip adapter and is attached with two #6 self tapping sheet metal screws. This tubing is 20 inches long. Another piece of aluminum tubing 15 inches long with a diameter small enough to slip inside the other tubing is used as the adjustable tuning element. Four slots 90 degrees apart and 1 1/2 inches long are cut into in one end of the larger tubing. A small diameter hose clamp is slipped over that end. With the smaller tubing inserted inside the hose clamp is tightened to hold it in place. This is repeated for the second element. A copper half inch thread to slip adapter is soldered to one end of a 36 inch piece of 1/2 copper tubing which is the support arm for the dipole. A copper T is soldered to the other end. Then, two 3 inch pieces of 1/2 inch copper tubing are soldered to the T fitting. This allows easy clamping to a mast. A solder lug is attached to each element using one of the self tapping screws holding the elements to the slip fittings. Your coaxial cable will be attached to these solder lugs. Center conductor to one, braid or shield to the other. You can get a little fancier and make an aluminum bracket to hold an SO239 socket and attach this to the T connector. Once you have it all put together as shown in the diagram it is time to tune it. Adjust the element lengths to the 1/4 wave length you arrived at with the above formula. Tighten the clamps so the tuning stubs can barely slide back and forth. Mark each stub where it enters the larger tubing. Using either hose clamps or U clamps attach the antenna to the end of a mast piece 10 feet long. The element to which the braid or shield of the coax is attached must be pointing down Support the mast so that is stands straight up with the antenna at the top. It is best to do this outside. Set up your transmitter and connect an SWR/Power meter between the transmitter and the antenna. Adjust your meter to read SWR according to the directions that came with it. SWR is the ratio of power coming from the transmitter and the power reflected back from the antenna. A properly tuned antenna will reflect very little power back, resulting in a very low SWR ratio. Too much reflected power can damage the transmitter. Turn on the transmitter and observe the SWR or amount of reflected power. Shut the transmitter off if the level is very high and check your connections. Rough tuning the antenna by measurements should have brought the readings down to a fairly low level. Turn off the transmitter and adjust each tubing stub up or down about 1/4 of an inch. Turn the transmitter back on and note the readings. If the reflected power and SWR ratio went lower you went the right direction in either increasing or decreasing the length of the stubs. Turn off the transmitter and continue another 1/4 inch in the same direction or the opposite direction if the SWR ratio and reflected power increased. Turn the transmitter on again. If the reading is lower continue to go in the same direction in 1/4 inch increments being sure to turn off the transmitter to make the adjustments. Continue to do this cycle until you have reached the lowest possible reading. At some point the readings will start to increase again. Stop there. You can do this with two dipoles as mentioned earlier in this section. Each dipole is tuned by itself and then both are connected with a phasing harness when mounted to the mast section. Radio frequency cables are referred to as coax as a generic term. It is short for coaxial. A coaxial cable consists of an inner conductor inside an insulating core .This is surrounded on the outside by a metal braid or foil, called the shield .This shield is in turn covered by an insulating jacket of plastic material. Coaxial cables are specified in terms of impedance which for most micropower broadcasting purposes is 50 ohms except for dipole phasing harnesses. In the 50 ohm category there are a number of choices when selecting coaxial cable. The most important characteristic of coax is it's level of signal attenuation. This depends on the length of the cable and its particular frequency response. RG58 coaxial cable has a high degree of attenuation and should only be used for short connections. RG8X or mini 8 works well for lengths under 50 feet and is suited for portable and mobile set ups since it is rather flexible. RG8 and its higher performance cousins such as 213 and Belden 9913 are the best for fixed installations. Belden 9913 has the lowest loss for any given length as compared to other variations of RG8. In fact, it has a loss figure at 100 MHz that compares well with commercial broadcast hard-line coax. It is rather stiff cable and must be installed correctly. Coaxial cables do not take rough treatment very well, especially 9913. They must be carefully rolled up by hand, not wrapped between palm of hand and elbow like a rope. Kinks are to be avoided at all costs. When routing a cable keep the bends from being sharp and keep it away from circumstances where it can be pinched or slammed. Three types of connectors are in general use - BNC, PL259 and N. Most micropower broadcasting equipment uses PL259 and its mating socket known as the SO239. Any connector will introduce some small degree of signal loss. N connectors are used where high performance and reliability are of most importance. A typical broadcast studio consists of an audio mixer (DJ style works best), one or more CD players, one or more cassette tape decks, a turntable or two, several microphones, and a compressor/limiter. Optional items can include a cart machine and a phone patch. Reasonable quality mixers start at $200 and go up in price from there. DJ styles are best since they have a large number of inputs available and support turntables without the need of external phono preamps. Any mixer you select should have least 2 or more microphone input channels. These should be low impedance inputs. Other features to look for include high visibility VU (level) meters, slide faders for each channel, switchable inputs for each channel, stereo or mono selection for the output signal, and an auxiliary output for an air check tape deck. CD players and tape decks can be your average higher quality consumer audio gear. Day in and day out usage will eventually take their toll so pay for the extra warranty period when it is offered. When one wears out in 6 months or so just take it back under warranty for either repair or replacement. DJ style turntables are the best choice for playing vinyl. Cheaper units just will not stand up to the wear and tear of daily usage. Select a heavy duty stylus as well. Microphones should be fairy good quality vocal types. They can be either directional or omnidirectional. Directional microphones will pick up less ambient noise but need to be on axis with the person's mouth for best pick up. Since some folks do not pay attention to where the microphone is in relation to their mouth, an omnidirectional might be considered a better choice if this is the case. A distance of about 4 inches should be maintained between the microphone and mouth. Place a wind screen foam piece over each microphone. Some microphones have built-in shock and vibration isolation to keep bumps to the microphone from being audible. It is a good idea to use some sort of isolated holder for the DJ microphone. An old swing arm lamp can be adapted to hold a microphone. For programmers who do a lot of reading on material on the air a headphone microphone is something to consider since it will maintain a uniform distance from mouth to microphone no matter where the head moves to. One drawback is that they tend to be a bit fragile in rough hands. Headphones are essential for monitoring and curing up program material. You can either opt for high quality rugged units that are a bit costly or plan on replacing an inexpensive set every few months. A limiter/compressor is an essential part of the audio chain. It is used to keep the audio signal from exceeding a preset level. Without this the transmitter will be overmodulated resulting in signal splatter and distortion. Signal splatter will cause interference with adjacent stations and distortion will send your listeners elsewhere. Common to most limiter/compressors are a set of controls - input level, output level, ratio, threshold, attack and decay. To properly set up the mixer, limiter/compressor and transmitter you start with a steady audio source (a signal generator plugged into the board or a test tone CD, tape or record). You adjust the input level and master output level controls so that the meters are reading zero dB. Master level should be at mid position. Audio output goes from the mixer to the limiter/compressor and from there to the transmitter. Do not turn the transmitter on at this time. Most limiter/compressors have indicator lights or meters to show how much gain reduction is being applied and the output level. Set the ratio control to the infinity setting, this enables hard limit function. Attack and decay can be set around mid position. Adjust the threshold and the input level until the gain reduction shows activity. Adjust the output level so that the indicator lights or meters show a 0 dB output level. Turn the level input on the transmitter all the way down and power up the transmitter. Monitor the signal on good quality radio. Slowly turn the level control until you can hear the test tone. Compare the signal level to that of other stations. Your level should be slightly less since most other operations are using quite a bit of audio processing on their signal. You may have to make fine adjustments to the limiter/compressor to get things exactly right. When everything is set up correctly any audio signals that exceed 0 dB on the board will be kept at that level by the compressor/limiter. You will need to listen carefully to the signal to make sure when a "hot" audio source exceeds this that the transmitted signal keeps an even level and does not distort or splatter. There will be some interplay between the output level and the threshold setting. Nor do you want a signal that is too low in level either since that will produce a weak sounding broadcast. A very important consideration is to keep as much distance between the studio gear and the transmitter as possible. RF (radio frequency signals) will find their way into audio equipment and produce a hum or other types of noise. You can separate the two areas by using a low impedance cable between the limiter/compressor and the transmitter. This can be a long microphone cable with XLR connectors or a made up shielded 2 conductor cable with XLR connectors. You can have about 150 feet of cable maximum. A high impedance to low impedance transformer will be needed at one end or both depending on whether the limiter/compressor and transmitter have low or high impedance connections. These transformers usually have an XLR female connector on the low impedance side and a 1/4" phone plug on the high impedance side. If your transmitter has an RCA style input you will need the proper adapter to go from 1/4" phone plug to the RCA plug. Your studio should be arranged to provide easy access to all controls and equipment with plenty of table space. An L or horseshoe shape works well for the studio bench. An open area within the sight line of the operator should be provided so their will be a place for extra microphones and guests. Although it seems like there is a lot to deal with in setting up a micropower station, it can be broken down into three areas- studio, transmitter and antenna. It should not be difficult to find someone with studio set-up experience to help with the project. Transmitters, particularly their construction and tuning, should be left to an experienced person. If such a person is not available there are a number of people who will assemble, test and tune your transmitter for whatever fee they have set. Stick to a commercial, easy to tune antenna such as the Comet if your skills are minimal. These can be purchased pre-tuned for an additional fee from FRB and L. D. Brewer. It best to put most of the energy into organizing and setting up the station. Experience has shown that once the technical operation is in place and running, it will require very little in the way of intervention except for routine maintenance (cleaning tape heads, dusting, etc.) and occasional replacement of a tape or CD player. What requires most attention and "maintenance" is the human element, however. More time will be spent on this than any equipment. As a survival strategy it is best to involve as much of the community as possible in the radio station. The more diverse and greater number of voices the better. It is much easier for the FCC to shut down a "one man band" operation than something serving an entire community. Our focus is on empowering communities with their own collective voice, not creating vanity stations. Why imitate commercial radio? Before you commit to your first broadcast it would be advisable to have an attorney available who is sympathetic to the cause. Even though they may not be familiar with this aspect of the law there is a legal web site which offers all of the material used in the Free Radio Berkeley case. There are enough briefs and other materials available to bring an attorney up to speed [The FRB case is an American specific case and the law is not the same in the UK - Libcom].